If your family uses any combination of desktops, laptops, and mobile devices, chances are you’d benefit from a home wireless — or “WiFi” — network. WiFi is short for wireless fidelity and just about any mobile device or current-gen PC will let you configure and use wireless technology. If you’re wondering how to create a WiFi network, you’re in luck, since it’s possible with only a few simple steps. According to a tip sheet released by the Wi-Fi Alliance, the first thing you need is a plan. Start by determining what kind of devices, and how many, you’d like to connect to your wireless network. For most users, this is a combination of desktops, laptops, and at least one mobile device per person in a household. Once you have a rough number in mind, decide what kind of network you prefer: peer-to-peer or base station. All wireless devices support peer-to-peer networking, but bandwidth and signal strength is limited since you’ll be using WiFi technology embedded in each device, rather than a central unit with a radio signal booster. If you plan to use three or less devices and all are in proximity, a peer-to-peer network is fine. Base stations function as central connection points for all your wireless devices and are a good idea if you want your network to cover an entire house. If you use a base station, consider an access point or gateway. Use a gateway if all you need are wireless connections, and use an access point if you have some wired connections in an office or computer room and also want to add wireless access. Mobile devices such as smartphones and tablets come with wireless functionality built right in, but some laptops and desktops only offer wired connection ports. 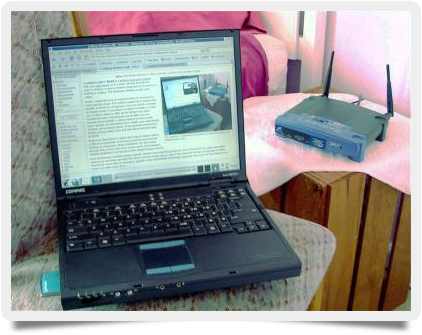 If needed, you can purchase WiFi radios which connect to a laptop’s expansion slot, or universal serial bus (USB) radios which attach to an available USB port on your computer. Simply install the necessary software (included with the radio) and you’re ready to go. When all of your devices are set to send and receive, you need to determine how much bandwidth your network needs (check your bandwidth with a speed test to find out). A standard 802.11b WiFi network can provide 11 Mbps of bandwidth in total, but bear in mind that number is shared among all users. If everyone in the house is using the network to send emails and browse the Internet, you won’t have a problem. However, if your family enjoys downloading high-resolution movies or playing online video games, you may want to consider a 802.11a or 802.11g access point, which offers 54 Mbps of bandwidth. Routers and gateways will state on the box which types of networking they support. Many support all three. Once you’ve purchased and installed your access point — it will connect to the Internet via an Ethernet cable, then broadcast a radio signal which your devices can “hear” — you need to secure the network. To do so, consult the manual that came with your router or gateway and find out its default IP address. Navigate to this address using your Web browser. Enter the username and password as required (usually “admin” for the username and in many cases no password needed). This gives you access to the router or gateway’s administrator menu. Use the menu to enable WPA2 encryption to keep your Web traffic safe, change the default name of your network to something other than the router’s name and model number, and set up a strong password to authenticate users. With PCs, laptops, tablets, and smartphones used in equal measure by families, knowing how to create a WiFi network is key, both for ease of access and device flexibility.